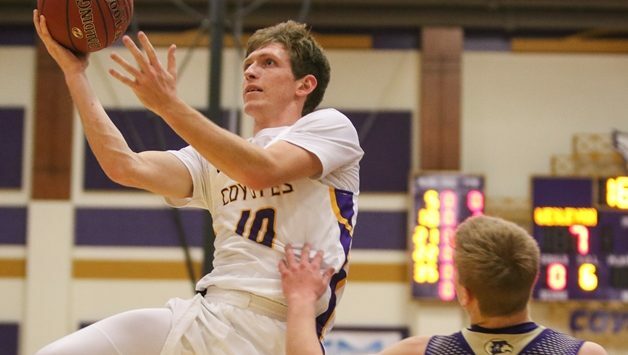 WICHITA, Kan. – James Brooks and Jordan McNelly of Kansas Wesleyan University have earned the KCAC Men’s Basketball Offensive and Defensive Player of the Week honors, respectively, the conference office announced Monday. The two student-athletes were selected for their performances from Jan. 28 – Feb. 3 by a vote of conference sports information directors. 6-2 | Jr. | G | Frontenac, Kan.
Brooks was huge for the Coyotes in two huge wins over Ottawa and Friends this week. He scored 24 in 23 minutes against Ottawa in a big win over the Braves. He then scored 21, while pulling down five rebounds on Saturday as the Coyotes upset No. 20 Friends. He hit nine 3’s during the week and shot over 53 percent from the field for the week. 6-5 | Jr. | F | Salina, Kan.
McNelly had the task of guarding Isaiah Palmer (Ottawa) and Jordan Murdock (Friends) this week. In the Ottawa game, McNelly held Palmer to his lowest scoring total of the season, seven points, on 2-of-8 shooting and 3-of-5 at the line. It is only the second time all season Palmer has been held to single digit scoring and stopped a string of 5 games scoring at least 25 points. In the upset win over No. 20 Friends, McNelly held Murdock to 22 points, well below his season scoring average. It was only the fifth time this season Murdock has been held to 22 or less points. He was limited to 6-of-15 shooting from the field and 1-of-8 shooting from 3-point range. Nine of his points came at the free throw line. He added 12.5 points and 4.5 rebounds per game for the Coyotes as well.